New RV Park on Beach Rd... Check it OUT....!! NOTE - Please be patient while this site loads. It contains pictures of the rental properties....Thanks! Fully furnished: 1-king 1-queen 2-full colorado river front satelite tv- dish range/oven, microwave, coffee pot, toaster refridgerator central heat/air pier w/fishing lights screened porch w/table and chairs bedding & towels. BRING YOUR OWN BEACH TOWELS DRINKS & FOOD. 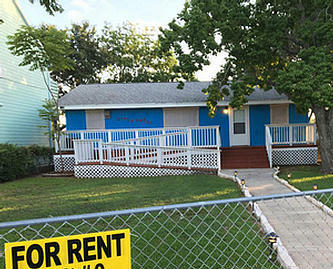 #11 - Weeks' Rental House - Come & enjoy yourself at our new weekend home! 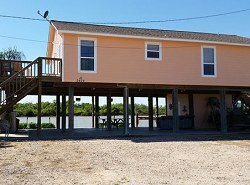 We are located on the Colorado River, just 2 miles South of the bridge.�Matagorda Beach is just a few minutes from our home.�East & West Bays are just a short boat ride away.�Actually you can view both bays from our home.�The town of Matagorda is just 2 miles away, offering many restaurants such as; Seafood, Mexican food, Cajun food, & Pizza!�Stanley Grocery store is located right before the bridge with fishing, tackle & supplies.�Public boat ramp located just past the bridge on Beach Road. Major Credit Cards Accepted, Last Minute Reservations Welcome! 2 bedroom, 1 bath, sleeps 8. 1 king bed, 1 queen bed, Living room has 2 futons, 1 queen; Full Kitchen is completely furnished, dishwasher, coffee pot, and toaster. Linens, and towels are provided. Bring your own beach towels. Satellite TV, Washer and dryer, 50 foot fishing pier. Plenty of parking space, BBQ pit. The"Crooked Cabin" - Furnishings and Features: Two bedrooms, large kitchen, spacious den with a GREAT view of River and fishing pier, cold A/C, lighted fishing pier with fish cleaning table, new bulk head, electric range, refrig, microwave, Satellite TV, Stereo, washer and dryer, all towels and linens furnished, sleeps six to eight adults (has 4 double beds plus couches if needed). Also available for your convenience are lawn chairs, BBQ pit, gas grill, fire ring and wood for "camp fire" out near the water. House has it all....even toiletries! Vacation Rental #76B is located midway between Matagorda and Matagorda Beach....features include three bedrooms, two baths, sleeps 8 persons, lighted fishing pier with cleaning table, Bar-B-Q pit, spacious upper and lower decks, lawn chairs, central hear and air and great views of the Colorado River and East and West Matagorda Bays from our decks. Our location puts you within a few minutes drive of Matagorda Beach. 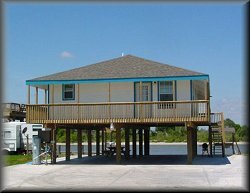 The Intracoast Waterway and both Matagorda Bays are easily accessible by a short boat ride. 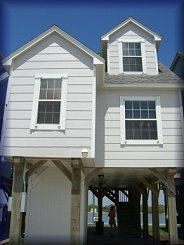 You will also be within a few minutes drive of the Matagorda Jetties, local bait camps, River Bend Restaurant and the town of Matagorda. Call 281-331-5239 for Reservations. Visit our website...Click Here. - #96 on Rd to Beach! Located on the Colorado River, just a little over 3 miles past the drawbridge, and minutes from the Gulf of Mexico, this 4 bedroom 3 bath home has all the amenities that the avid angler or birder could want. Upstairs has central air and heat, with an open floor plan including a fully-equipped kitchen, dining area and living area with DishNetwork and DVD. Dining room has oak table that seats 6. There are 3 bedrooms and 2 full baths upstairs, and 1 bedroom and 1 bath downstairs. Master bath also has a tub. 107 Beach Road (FM 2031) sleeps 8 persons, 3 bedrooms, 2 baths, queen in master, two new fulls in guest #1, two new twins in guest #2, large kitchen with all new appliances including oven, microwave, refrig, dishwasher, coffee maker. 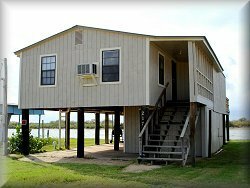 Kitchen is completely furnished, separate dining area overlooking river, large covered porch overlooking river and great view of Matagorda bay. Spacious living area with satellite TV. 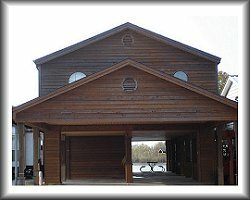 Has 42 foot fishing pier, covered fish cleaning table, large picnic table, large BBQ pit and plenty of parking space. 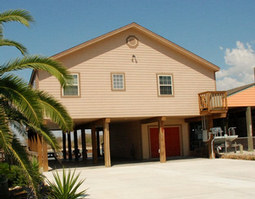 It is located two miles from River Bend restaurant and only three miles from the Matagorda beach and jetties. No smoking, no pets. Call 713 302-9443 or 713 302-8967. - #133 - Vacation Rental Beach Rd. 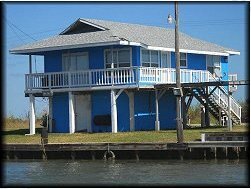 We invite you to enjoy our lovely river front beach house located in Matagorda, TX at 133 Beach Road on the Colorado River. It is a mere five minute drive from the Matagorda beach. You will see spectacular sunrises and sunsets from the sundeck or bring a good book and relax in the hammock downstairs. Have fun with board games such as; scrabble, trivial pursuit, checkers or cards, all provided for you and your family. Go for a stroll on the beach or take a walk out on the jetties at the mouth of the river. Enjoy delicious, fresh seafood cuisine only two minutes away at the local Riverbend Restaurant while playing a game of shuffle board or pool. Whatever your pleasure, we are sure that you will enjoy your stay at the Krenek�s beach house and be back for more. Remember...."Mi casa es su casa!" The Boardwalk features two queen beds, two twin beds and a queen sofa bed and each will sleep a total of 8. TV with Satellite Washer/Dryer 1 1/2 bathrooms Bed Linens, bath towels and cooking utensils and pots supplied-must bring own food. We also have a lighted pier and patio furniture. No Smoking No Pets We are located right next door to Rawlings bait camp where the renters have access to a small store, boat launch, bait, cleaning tables, and of course fresh seafood to eat. Great views of both East and West Bay. Bulk head with large wide dock, ideal to have a fishing guide pick them up on the way offshore or fishing the surf. Seconds up the road from the beach and mouth of the river into the Gulf. Call 817-578-7380 or 817-279-0906 for information and reservations. Visit our Web Site for rate info. and additional details...click here! Welcome to the Hooked Up Lodge....! Fish the Jetties, Wade the Bays, Play on the Beach, Relax at Hooked Up Lodge! 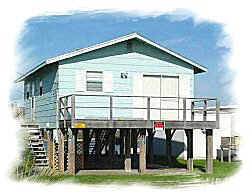 Sleeps 6 comfortably, maximum of 8 ~ 3 Bedroom, 1 ½ Bath Trout Room - Queen Bed Redfish Room - Queen Bed Dolphin Room - Twin Bunk Beds and Twin over Double Bunk Beds Hooked Up Lodge - Features: · New vacation rental in Matagorda on the Colorado River · Beautiful views of East and West Matagorda Bay · Watch the sun set from the deck · One Mile from Beach · Boat access to East and West Bays and the Gulf of Mexico · Next to Rawling's - Ice, Bait, Drinks, Table Shrimp, Public Boat Ramp · Dock your boat or fish at the pier in front of house. Fully Furnished · Dishes, Utensils, Pots and Pans Provided. Visit our Web Site and see much more! 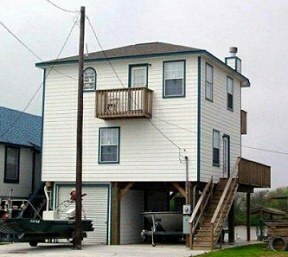 New Vacation House Rental for 2005. Overlooking the Colorado River and West Matagorda Bay. 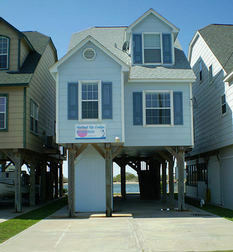 We are the last house on the river and the closest to the beach, which is less than 5 minutes away. You will enjoy excellent fishing on our pier since it is the first pass for big fish coming in from Gulf of Mexico. Sleeps 8 persons. Spectacular view from our deck. We accept credit cards via PayPal. Planning on taking the pet(s) along? Please inquire. Furnishings and Features: Six private comfortable rooms available. 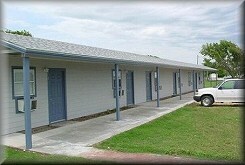 Each room has two double beds with full bath/shower and cable TV. Full carpeted with cold AC....All NEW! Our Location: We are conveniently located only minutes from local restaurants, convenience stores, boat ramps, and bait camps. Nearby Matagorda Bays and Beach offers visitors beachcombing, shelling, birdwatching, fishing and swimming and both are only a few minutes away by boat or car. 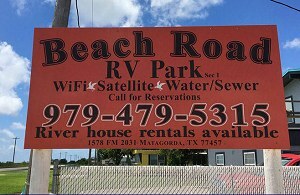 Rental Rates and Reservations - Call 979-863-1000 - Visit our Web site here! 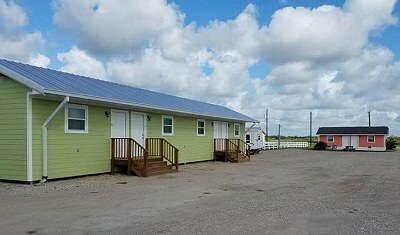 Secluded, newly built cabins offer a great get away for the weary fisherman. 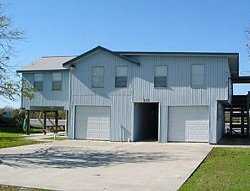 Great location....Matagorda Harbor is only minutes away, as are local restaurants and convenience stores. Great fishing in East and West Matagorda Bays....Just minutes to bait camps and and boat ramps along the River Rd. or at the Harbor. Safe and very secure location. Matagorda Beach and the Matagorda Jetties are only a 8 minute drive. 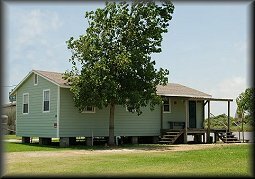 Thanks for visiting the Matagorda Lodging Rentals web page. Advertising space is also available here as well as web sites under this domain name..
Click here for more information regarding current rates.